I’m not going to teach people how to use a library or build a database. Instead, we’re going to talk about the politics and aesthetics and ethics of organizing information…or media…or data…or knowledge — these four terms are not interchangeable, and we’re going to talk about that, too — through these different intellectual architectures. And given my interests, we’ll of course talk about some physical architectures as well. The course title‘s a bit different this year. Last spring it was Libraries, Archives + Databases — but only because the timing of our various field trips dictated that we start with the libraries section and put archives in the middle. This year, I’m not going to allow field trips to dictate our schedule; I think it’s important for the conceptual integrity of the class to start with archives, then move along historically (although not teleologically!) as we go through the semester. As we did last spring, we’ll probably go on field trips to the Reanimation Library, the Morgan Library, and the Municipal Archives. I’ll try to find a couple other sites, too. And I’ll bring in some interesting guest speakers. Historicizing Information Overload: we’ll read some Clay Shirky, Ann Blair, and Borges. Ordering Media’s “Innumerable Species”: We’ll read some Georges Perec (ah, my favorite! ), David Weinberger, and some classification and ontological theory. 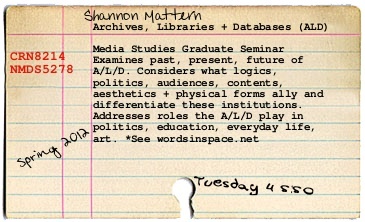 Exploring the Archives: We’ll read some Foucault and Derrida and some archive theory from Terry Cook. We’ll also visit the Municipal Archives this day. What’s in the Archive: For this week we’ll read Wolfgang Ernst and some other stuff TBD. Who’s in the Archive: We’ll read some Ann Stoler and Diana Taylor, and we’ll examine the work of Raqs Media Collective and the Atlas Group. Archival Aesthetics: We’ll read Hal Foster on the “archival impulse” and Susan Stewart on the Wunderkammer, we’ll listen to ta Tate Modern conference on “The Archival Impulse,” and we’ll study the work of some archive-minded artists like Ann Hamilton, who happens to be my hero. Plug-In: We’ll save a week or two in the middle of the semester where we can talk about things, or visit sites, or talk with people, that reflect students’ interests. Libraries: From Mesopotamia to Madison Avenue: This day we’ll visit the Morgan Library, and we’ll read both about that specific library and about the general history of libraries in Matthew Battles’ excellent Library: An Unquiet History. Idiosyncratic and Unorthodox Libraries: We’ll read more Perec, and we’ll examine the Warburg and Prelinger libraries. The Future Library: Because there’s always new material being written on this topic, our specific readings will probably be drawn from current media. It’s likely we’ll talk about the Digital Public Library of America and a couple recently constructed library buildings — and we might read the article I’m currently writing on pop-up libraries. Tabula of Relationships, Orders of Things: Here we’ll read more Foucault and Manuel DeLanda (not my favorite), and we’ll introduce ourselves to Paul Otlet and Vannevar Bush. A Database Episteme: We’ll read some theoretical and practical stuff on databases — including Ted Byfield’s intellectual history of “information,” Alan Liu’s work on “transcendental data,” Eugene Thacker’s work on bioinformation, and some basic histories of databases. A Database Aesthetic: We’ll read Lev Manovich and Christiane Paul, and we’ll examine the work of a few database artists. Final Presentations: We’ll save the final two weeks for students to present their semester projects.